setting’s memory in order to investigate the relations that can be established between the artwork and the space in a specific context. However, beyond a relational approach, by means of direct confrontation with the works, I see propositions about the support, about gesture and control in the production of images. Yet, a spiritual state may also be identified in the plastic specificities of the artwork. Everything is so still, the silence of words in drawers and of piled up chairs, the world that slumbers in a gelid card catalogue. This idea of quiet images is what first assaults the gaze in this series of works. But noise also accompanies the digression. Something agitates at the edges, in the margin, nothing neutral about the framing of the objects in the library. These images condense a state of melancholy in what this feeling has of saturation before the real, a mixture of pleasure and conformity with life as it is. Melancholy here suggests immobility and surprise, at the same time, there is a certain vain satisfaction of recognition: the images are perfect and elevated, centralized and defined. 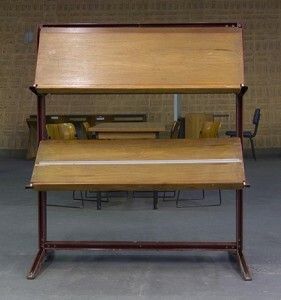 A library, its furniture are not intrinsically loaded with this sentiment, this melancholy, but the artist’s use of framing points to this possible reading. A frame of air envelopes the objects in the images provoking their suspension, taking them into the volatile terrain of art, where nothing is simply what it seems. Through this clearly affirmed margin, by no means alleatory, reflection has been built upon the control of image construction and the choices that lead to readings. By means of this margin, things lose their natural continuity with the world. Isolated, they acquire the melancholic air of immobility. The photographic instant that freezes everything is always arbitrary and choosing such familiar and commonplace furniture denote an interest in this visuality as well as a way of relating to words: seeing a word as a thing, beyond its concept. The word-object, the word-rake, the word-definition, the word-drawing – approaches recurring in the written language of the artist’s other artworks, appearing here as a word-image-context, the library as a place for organizing, classifying, systemizing the categories of text. What is constant in every approach is a mixture of curiosity and acidity in relation to how the word adapts itself to everyday objects. Today, photography is open to so many possibilities it would be unfruitful and useless to try to take every facet into account, but I can’t resist thinking of these images as part of a quite affirmative whole. This refers to the technical skill of recording the real in its most elevated form of stupidity, allied with the ability of the person who photographs to propose readings both about the object she has chosen to eternalize, as well as about the photographic act itself. 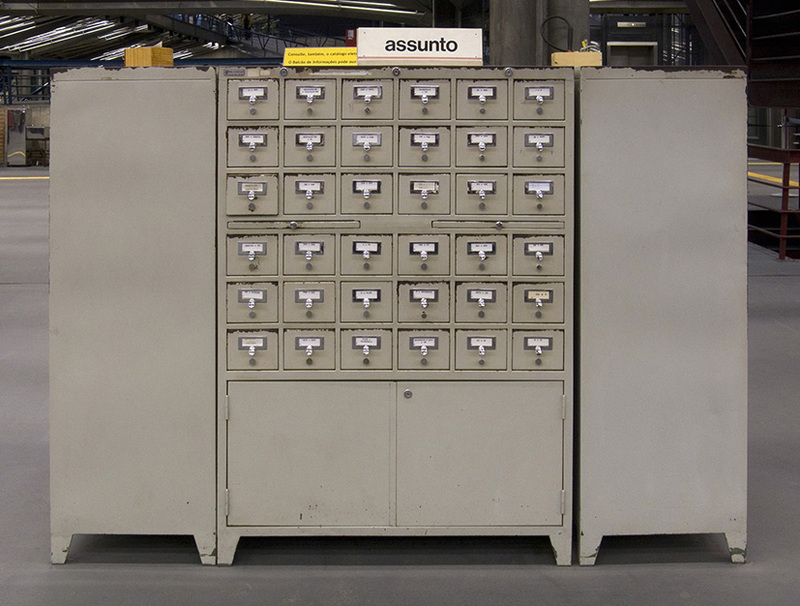 Text written for the solo exhibition “Biblioteca” (“Library”), at the Centro Cultural São Paulo (2008). This exhibition won the acquisition prize at Programa de Mostras do CCSP, and nowadays the whole series belongs to its collection.